BACON CHEESEBURGER. When the envie (craving) strikes, you must obey. Five years ago, New Orleans wasn’t really a burger town. Things change. Tru Burger, Cowbell, Smashburger, Charcoal, and Company Burger are all competing, just in Orleans Parish. Camellia Grill opened a second location in the French Quarter. Mid-Atlantic favorite Five Guys is coming soon to Elmwood. Now, a diner with a craving has choices. I satisfied my bacon cheeseburger jones at Company Burger (4600 Freret St, New Orleans, LA). Thick cut Nueske’s bacon puts it over the top, though I’d prefer a more assertive cheese to the mild American used at Company Burger. Medium cut, skin-on fries ensure that the burger isn’t lonely, and counter service makes the transaction quick and food-focused. Company Burger also offers daily changing specials, so a a non-bacon-cheeseburger-craving diner will have choices. 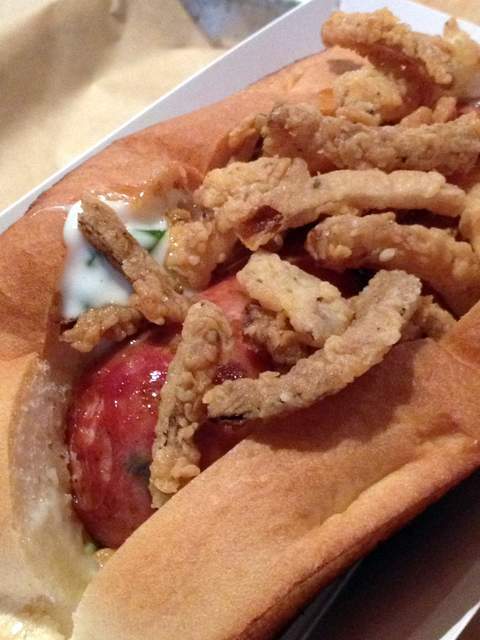 A recent smoked pork/green onion sausage from boutique butcher Cleaver & Co, pictured at right, nestled happily beneath fried onions on a toasted roll. 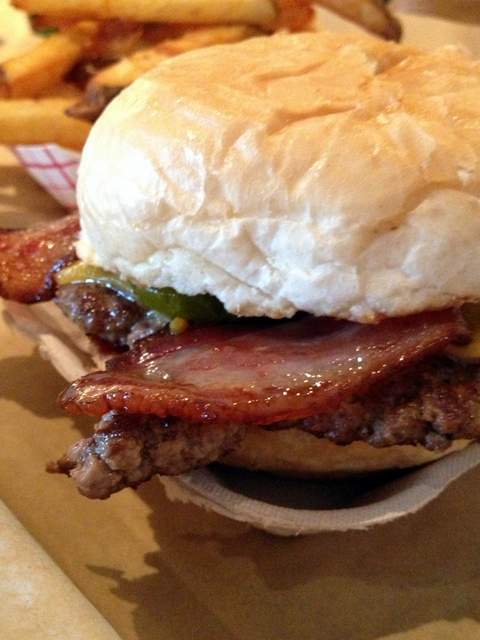 If you gave up bacon cheeseburgers on Ash Wednesday, don’t fret. Throughout Lent, Company will offer daily fish sandwich specials–think griddled scallops and griddled flounder with fennel slaw. Been there before. Great burgers. Can’t wait to go back. Sounds like several good options. That sausage looks wonderful!